Lately, drones have become very popular both as professional tools and for recreation and air sports competitions. Drone or UAV (Unmanned Aerial Vehicle) are generic terms that includes many types of unmanned, remote controlled aerial vehicles. This includes fixed wing planes, helicopters and multi-rotors. Professional drones have a wide range of applications. Aerial photography during sports events does not have to rely on expensive full size helicopters, and real-estate agents frequently use drones for documentation. Drones discover missing people, and can monitor habitats exposed to risk of pollution. Electricity companies are now inspecting some of their high-voltage lines without expensive power outages and risky climbs. Even a conservative industry like the railway companies are considering drones for inspection of disrupted tracks in areas with limited access. Several companies plan to deliver small packages by drones, but it is not a commercial reality yet. This is partly due to regulatory limitations. Drones can be piloted in two different ways, either line of sight by visually observing the drone, or by First Person View (FPV). In an FPV system the video image from an on-board camera is transmitted by radio to a personal video display on the ground in the form of a screen or video goggles. 5GHz Wifi network is preferred due to less interference in that band in urban areas. Common solutions are from those who fly FPV (First Person View), they use simple analog cameras connected to 900 MHz. With a 1 W 900 MHz transmitter with a cloverleaf antenna (a common antenna type), and a 18 dB gain patch antenna directed at your craft you can easily get 5+ miles line of site. It depends upon the region where one wants to operates and so as band availability for using such applications. One can use the 3G/4G dongles attached to the drone, for wireless transmission of high data rate. 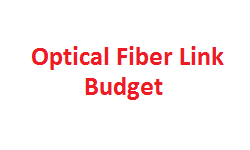 This solution can be used as per the availability of 3G / 4G network in that operating region. Integrated RF transceivers are not only widely employed in software-defined radio (SDR)1 architectures in cellular telephone base stations, such as multiservice distributed access system (MDAS) and small cell, but also for wireless HD video transmission for industrial, commercial, and military applications, such as unmanned aerial vehicles (UAVs). One can use the RF transceivers line AD9361/AD9363 and make the right hardware based on the their spectrum availability as these transceivers are wide band upto 6GHz. 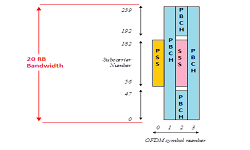 One base band side suitable FPGA can be used for digital processing. For more information on this type of custom solutions, refer analog.com website. The range of the wireless video link is limited by a number of factors. The path loss itself will diminish the signal when distance increases, and obstacles in the line of sight can give additional attenuation. However in a natural environment there are some less obvious challenges to the radio-link that require clever solutions. We will take an in-depth look at the two main issues. Other sources of radio transmission in the environment can interfere with the main signal. If the interfering signals occur in the same frequency band as the wireless video link it will act as inband noise. This will reduce the signal to noise ratio, resulting in a noisy video image and limited range of the link. 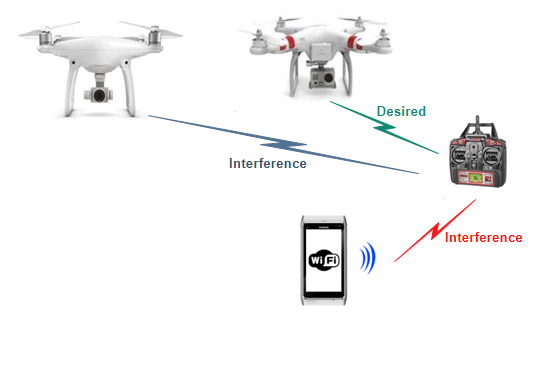 A typical interferer can be the video transmitter of another drone in the area, a nearby WiFi hotspot or mobile phone. The problem can be minimized by selecting a channel as far away in frequency from the interferer as possible, or by moving the video receiver and antenna. If the source of interference is powerful, but outside the band of the wireless link, it is called a blocker. The blocking signal can penetrate insufficient front-end channel filtering, and decrease the dynamics of the Low Noise Amplifier (LNA). Even with a strong, noise free signal, a radio link can get sudden dropouts, especially in cluttered or urban environments. This can be due to the reflected propagation path canceling the direct propagation path. 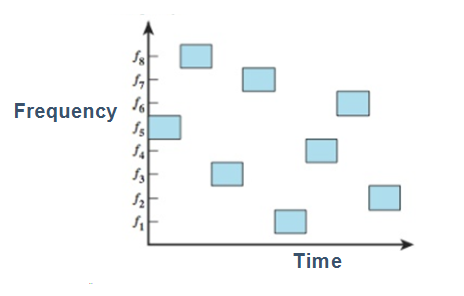 The canceling occurs because of the phase shift associated with different propagation delay. This occurs at a specific point of the receiving space, and can disappear just by moving the antenna less than one wavelength. 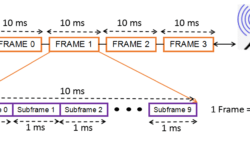 In addition to signal cancellation, multipath propagation also results in symbol delay spread. The symbols from the various paths arrive at different time, causing bit errors if the delay is significant. The 2.4 GHz frequency is widely used for Wi-Fi, Bluetooth®, and IoT short -range communication, making it increasingly crowded. Using it for wireless video transmission and control signals increases the chances for signal interference and instability. This creates undesirable and often dangerous situations for UAVs. Using frequency switching to maintain a clean frequency will keep the data and control connection more reliable. When the transmitter senses a crowded frequency, it automatically switches to another band. 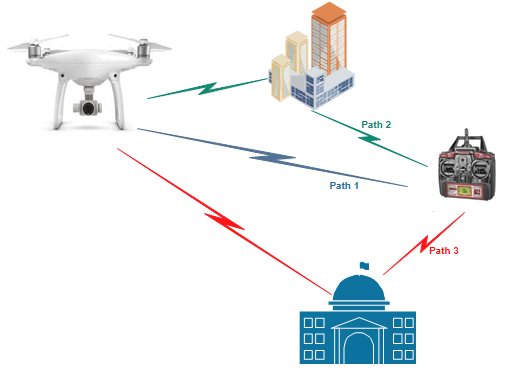 For example, two UAVs using the frequency and operating in close proximity will interfere with each other’s communications. Automatically switching the LO frequency and re-selecting the band will help maintain a stable wireless link. Adaptively selecting the carrier frequency or channel during the power-up period is one of the excellent features in high end UAV. Fast frequency hopping, which is widely used in electronic countermeasures (ECM), also helps avoid interference. Normally if we want to hop the frequency, the PLL needs to re-lock after the procedure. This includes writing the frequency registers, and going through VCO calibration time and PLL lock time so that the interval of the hopping frequency is approximate to tens of microseconds. 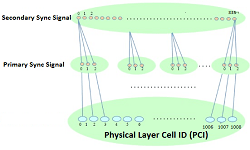 Orthogonal frequency division multiplexing (OFDM) is a form of signal modulation that divides a high data rate modulating stream onto many slowly modulated narrow-band close-spaced sub-carriers. This makes it less sensitive to selective frequency fading. The disadvantages are a high peak to average power ratio and sensitivity to carrier offset and drift. The OFDM is widely applied in the wide-band wireless communication PHY layer. Wireless video for FPV drone piloting is still immature technology, and we will see compact and low-cost HD FPV systems emerge in the near future. The key to lowered cost is increased integration of systems on chip and a resulting high volume. Paradigm shifts will occur when totally new radio, camera, or display concepts emerges. The next generation of cellular and WiFi technology, termed 5G will exploit dynamic beamforming to increase system gain and keep interference low. Together with more sophisticated MIMO this will increase performance and transmission bandwidth further. It is likely that these concepts will be applied for future FPV systems when the technology matures. This will result in higher performance with extended range, higher image quality and better reliability. It will enable drones to handle more of our present challenges, and those we have not come to think of yet.